Slurry displacement piles are cast in drilled hole pile (CIDH) where drilling fluid is used concurrently with drilling operation to excavate drill hole. Drilling fluid is a slurry introduced in drilling to prevent caving in unstable ground and to restrict groundwater to penetrate into drilled hole. One of the main causes of pile defects is problem associated with settlement of materials at drill hole. The concerned materials are that held during drilling within the suspension of slurry and settled from suspension either during or before placement of concreting. These materials may also be come into suspension as a result of inadequate or improper cleaning of base of drilled hole. 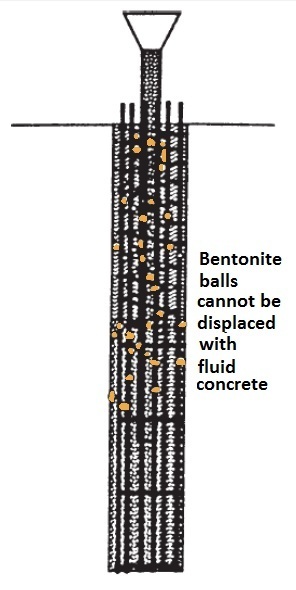 Materials can be entrapped underneath tip of pile with placement of concrete as shown as Fig-1 or can be covered and lifted by fluid concrete to get caught by cage of reinforcing bar of pile or caught against walls of drilled hole but not displaced by fluid concrete as shown in Fig-1. They can come out of the suspension and can be accumulated onto top of concrete during placement, they become covered by concrete when it rises and as described above may attach to reinforcing bar cage for pile or may attach to sides of drilled hole. During testing of pile, the deposition will be recorded as areas having lower density relative to sound concrete. Excess settled materials are observed in mineral slurries which are not cleaned properly or agitated and contain excess amount of materials and carried with suspension. Such excess amount of materials can also occur in slurries of synthetic origin if these slurry contaminated by the encapsulation of clay particles or when enough time is not provide to settle materials out prior to final cleaning of bottom of drilled hole. Mineral slurries should be mixed thoroughly in mixing tank and left for fully hydration before to supply into the drilling hole. The mixing & hydration of these slurries generally takes several hours. The proper hydration of slurry can be determined time to time by marsh cone viscosity test. Usually a mineral slurry will attain its maximum viscosity when it is fully hydrated. Thus at stable maximum viscosity of mineral slurry, it is considered that it has been completed hydration and as well fully mixed which will yield a slurry of homogeneous, smooth and not flocculated. 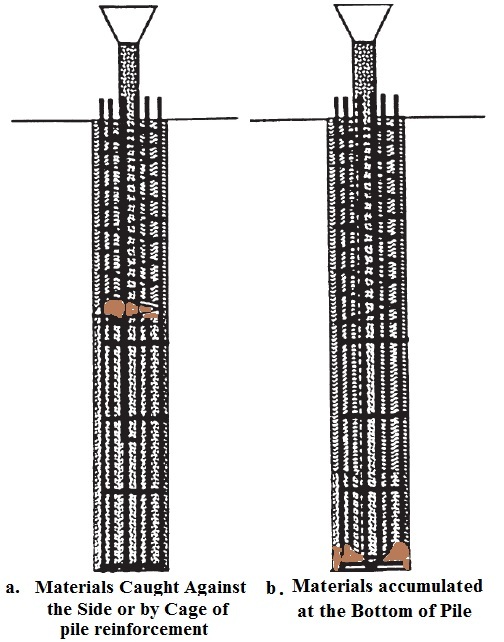 When mineral slurry is not mixed properly and is not left for adequate hydration, they can produce clumps or balls which can be attached to reinforcement cage of pile and cannot be removed or displaced under concrete placement as shown in Fig-2. When minerals slurries remain in drilled hole for significant time, they can form filter cake which is so thick that fluid concrete cannot scour off sides drilled hole as shown in Fig-3. Mineral & synthetic slurries as well carrying excessive amount of materials in suspension can result precipitation when they take part in any chemical reaction unexpectedly. It is possible when concrete is supplied through drilling slurry. 1. Defective pile top due to inadequate waste of contaminated concrete with slurry.This is the most common defects associated with wrong placement. When concrete is delivered even through sealed tube, slurry-contaminated concrete is arrived at the top of bore hole. To avoid such defect, it is suggested to waste within pile a volume of concrete equivalent to volume of one pile diameter. 2. 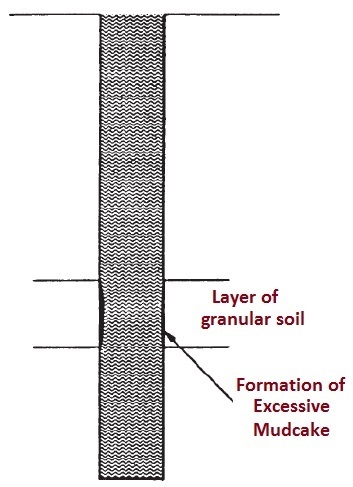 Settled materials within concrete layer: Loss of seal between drilling slurry and head of supplied concrete; it is relatively less frequent in piling operation.In this case inevitably drilling slurry is entrapped within concrete as shown in Fig-5. When placement tube of concrete loses seals and permit concrete from placement tube to fall through slurry onto head of concrete, any settled materials within drilling slurry can be trapped within concrete layers on head of concrete, results such defects. Usually such situation occurs when concrete placement tube is lifted very quickly and pulled out from concrete head. 3. Folding of concrete: This is less frequent case of pile defects which occurs when concrete head is started to set, folding of concrete over while it comes out through reinforcement cage of pile and trapped drilling slurry and associated settled materials within it as discussed earlier. 4. Excess water in concrete: this is the deficiency of mix design; engineers must not allow to use excess water in mix design or allow water to add in excess of required amount in concrete at job site to achieve necessary fluidity. In this case, large amount of bleeding water may come out after concrete placement, which is an indication of segregation and subsequent subsidence of pile concrete which may result a defects in concrete throw-out entire length of pile. In case of synthetic slurries, if concrete contains free water in excess, polymer chains of drilling slurry will be attracted into concrete by this free water; which will yield a contaminated material called oatmeal at the interference of concrete and slurry. There have good chance to catch this material by reinforcement cage of pile bar and results pile defects. The above defects can be avoided if contractor and engineer strictly flow parameters included in contract specifications. Such specification assist us to ensure proper mixing,quality of drilling slurries, proper qualities of concrete mix design and appropriate methods to place concrete. Contract specifications prescribe as well suspension of concrete placement with slurry displacement unless written modifications of pile construction method are submitted to engineer and accepted by him. This will prevent failure of project due to application of wrong method of pile construction.